Every Wednesday authors for FFI Practitioner share insights on the field of family enterprise advising and consulting from a variety of vantage points. Today we’d like to invite you to Write for FFI Practitioner! And… as inspiration, we point you toward examples of articles from contributors across the globe and some topics that could use more contributors. The Best Doctoral Dissertation Award is given to encourage and recognize outstanding academic achievement in the field of family business study. The Best Dissertation is awarded annually after a blind, peer review of all submissions. As 2018 is winding down, we’re taking a look back at “the year that was” for FFI Practitioner. We hope you’ve enjoyed reading and listening to the 50 editions by more than 65 authors published this year. This week, we’re pleased to share the 10 most popular editions from 2018! Managing Wealth as a Business: A Family Office – to be or not to be? When should a family begin to think about forming a family office and what factors should they consider when making this decision? Thank you to Iñigo Susaeta, this week’s contributor for continuing FFI Practitioner’s series of articles written in both English and Spanish by members of the FFI IberoAmerican Virtual Study Group. Accounting for between 65 and 85 percent of all businesses worldwide, family enterprises are crucial drivers of both the prosperity of nations and the global economy. Thanks to Marianna Martinez, a member of the FFI IberoAmercian Virtual Study Group, for this article entitled, “Eight Strategies for Conflict Management in Family Meetings.” You have your choice of reading in in English or in Spanish! More articles from this group will be forthcoming. We appreciate their taking the lead in helping us publish in two languages! Thanks to this week’s contributor, Harvey Taraday of TCH Partners LLP for his comprehensive examination of an often utilized but seldom examined step of the consulting process, the engagement letter. The 2018 Conference Program Committee is pleased to announce a wide-variety of educational sessions for this year’s conference in London. Family firms, like all modern businesses, must depend on growing levels of innovation in order to survive in an increasingly competitive global marketplace. This week, Diogo Cotta and Niklas Rossbach from Maastricht University discuss some alarming trends concerning innovation in family businesses and introduce a research project they’re conducting to learn more about how family businesses approach innovation opportunities. 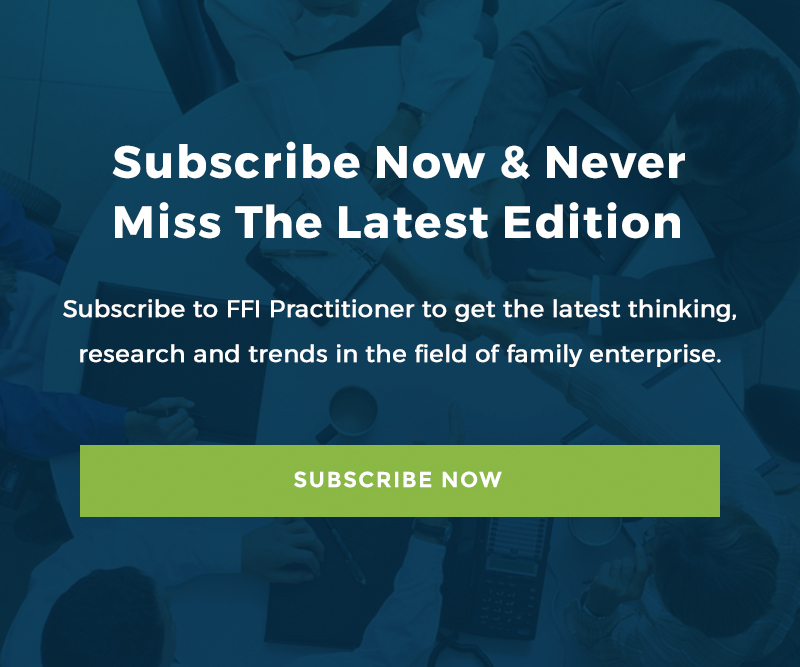 In this week’s FFI Practitioner, we are pleased to share a compelling précis of “Nonfamily Members in Family Firms: A Review and Future Research Agenda” – an article that appears in the March 2018 issue of FBR. Thanks to Guido Corbetta of the FBR Research Applied Board for sharing an insightful review of the research’s key findings as well as discussing its practical implications for advisers in the field. Applications for the 2018 Scholarships are now open and must be received by April 15, 2018.